For the first time since his creation, Top50world has got a partner with one of the most famous contests on the world, The Eurovision Song Contest. 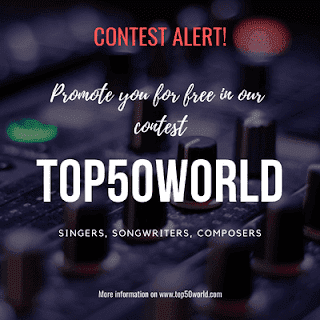 The winner of the contest "Top50world: Promote Yourself" could participate at the Eurovision Song Contest 2019. For that, you have just to send us an e-mail to contact@top50world.com with a little description of you and your creation. We will try all our possible to promote you. Meet the artists around the world who want to make themselves known, You can be part of them! "Promote Yourself Top50world" Now you can participate for free! with a lot of other participants. You can read the legal bases of the contest.